There are 24 posts tagged career (this is page 2 of 2). A retail outlet of a leading shoe brand recently opened up in near vicinity. The design of the store is flashy with impressive interiors and product arrangement. The brand carries a lot of consumer trust since many years. Good store, great brand and competitive prices all at one stop. The only (and probably the biggest) irritant there was attitude of their staff. They seemed too busy and non-responsive leaving many customers (including myself) waiting for long. Frustration amongst customers was visible. The business owners invested a great deal in expensive interiors, they did not think enough about investing in getting the right people, training them and managing their attitudes. From selling shoes to writing software, every product has to have a strong “service” layer. People enable this layer. At the local shoe store, things were not meant to be that way, but people made them so. In a knowledge/service oriented world, quality of product, environment and infrastructure is just the beginning. Quality of interaction, quality of care, quality of being human, quality of walking that extra mile to delight the customer matters more. They need to complement each other. The “attitude of quality” is about wanting to do the right things. Even if they are not prescribed that way. When no one is watching. When it takes a bit of extra effort. When you are not paid ‘extra’ to do it. In the current scenario (and the time to come), a professional’s ‘attitude of quality’ will be a key differentiator for his/her success. I remember a project manager who would test everything before sending it to customer, even after the inspection team had signed off the deliverable. He toiled at the last moment, late in the night to ensure things because he cared. Because he carried an ‘attitude of quality’. He wanted to delight the customer. Quality is an attitude. The work we deliver, the products we ship and experiences we extend to customers reveals this attitude. Invest in quality of your product/service, but do not forget to invest in people who carry the right attitude. Because only excited, engaged and enthusiastic people can excite the customers and pass on the enthusiasm. People (and their attitude) is at the core of excellence. We need more ‘attitude of quality’ in our businesses and service organizations. In an ever-expanding new world of work, leaders have to reach out to more people and spread their ideas. A lot of leaders do presentations of all kinds (sales/training/conferences) but are not sure how to make them really effective. 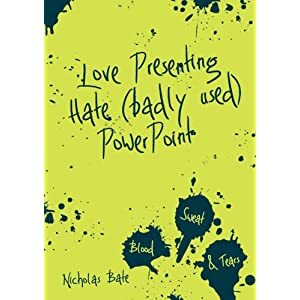 Nicholas Bate delivers what the world really wants – an effective guide titled “Love Presenting Hate (badly used) PowerPoint” on creating and delivering presentations that get people to act. Design and content organization in the book is a great example of an effective presentation. Vibrant cover, hand-drawn illustrations (more on his blog) and succinctly presented content (with a lot of lists, of course) makes this reading experience a very pleasant one. Here’s what I have observed in many presentations attended: there is too much of “information” and too little of “inspiration”. Without inspiration, it is very difficult to get people to do something. Isn’t it? Like any other art, the purpose of presentation is simple: to transfer the energy and emotion, not just information. A presentation that does not do this, fails to make any mark. This book is a quick read with less than 100 pages, and the one that you might want to refer before every presentation you deliver. In corporate setting, a lot of people depend a great deal on their employers for their own growth. When it comes to consolidating the skill-set or acquiring a new skill in their area of work, they wait for someone to come and train (read ‘spoonfeed’) them. During a recent interview I conducted, I asked the candidate about specific/basic skills to which the candidate responded, “I never got a chance/opportunity to work on that in my current job” or “I was never given training on that”. Such statements tell a lot about a person’s commitment to their work. The pursuit of personal mastery is a personal one. It is nice that your employer supports and pays for some of those trainings. But ultimately, it is your responsibility to put those lessons into practice. Your growth is about you, and it is personal. It starts with commitment. Unless you are committed to learn, no learning can happen. Training doesn’t guarantee learning unless you are committed. Commitment also means that you have a deep sense of responsibility for your work and knowing that constant learning will help you do it better. Initiative is important. Once the training is done, how much do you experiment with the subject? To put lessons into practice, ability to move beyond the fear and initiate is vital. You don’t need anyone’s permission to grow. So is choice. As a mature professional, what career path you select, what will you study/learn, who will you learn from, where will you learn from are all important choices. Leaving these choices to someone else may be a risky affair in the long term. No one knows you as well as you do. Resources are abundant. Fortunately, we are living in a world where a lot of high quality learning material can be accessed for free. Online conferences, blogs, free events, high quality technical resources, eBooks are all free. So, access to quality material is no longer a competitive advantage. What you do with them is. It is worth the investment. Instead of waiting for anybody else to pay for your training, pay it yourself. It is a worthy investment, not only because you increase your value as a professional, but it also helps in building a high self esteem. Constant learning helps you remain focused, positive, optimistic and hence, happy. – What did I learn in past week/month/quarter/year? – How did I evolve as a professional? 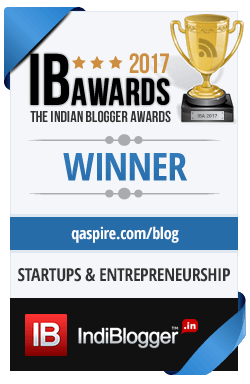 – Has my learning helped me in expanding my own capacity to contribute? Join in the conversation: Have you encountered people who rely on their employers for their growth? What have you learned from people around you who take complete responsibility of their professional growth?